For many breeders, the key to consistent Harlequin Appaloosa alpaca color production has been a closely guarded secret. Because of the rarity, and increasing popularity, of this coloring, many breeders feel that this secrecy is critical to protect the gene's value. Their logic is certainly not invalid. I have seen this scenario played out in many, many animal industries throughout my lifetime, and I can attest that if a color is rare and valuable, there will be breeders out there who will seek to cash in on that popularity. These breeders will produce color for the sake of color, and will flood the market, thus eliminating the added “rarity factor” value. This is unfortunate, but the fact is that it is also inevitable. Serious, committed Harlequin Appaloosa breeders need to look beyond the “rarity factor” and focus on the future, which is quality. In order to produce quality Harlequin Appaloosas, however, we must first understand how to consistently produce Harlequin Appaloosas, so that we can focus on the quality and not the color. Yes, putting this information out there means that some unscrupulous breeders may use it to overproduce Harlequin Appaloosas, and in time, they will be less rare and thus, less valuable. However, a quality animal is always valuable, and I feel that if this information can assist serious, committed breeders in their goal of breeding quality Harlequin Appaloosas, it is well worth disseminating. Please note that this text assumes that the reader has a basic knowledge of a genetics. For those totally unfamiliar, I recommend the Cornell University Agriculture and Life Sciences department's website on basic animal genetics. While I highly recommend that an interested party read through all of the subsections in order to gain a more complete understanding of the topic, the subsection entitled “Simple Inheritance” is the most relevant. Please note also that I choose to capitalize the names of individual genes and loci. Not every author of genetics texts chooses to do this, but I feel that it helps with clarity. Alpaca color genetics is one of the most confounding topics surrounding this wonderful species. Although alpacas have been domesticated for over 6000 years -- longer than most domesticated species -- the mechanics of their color inheritance remains largely a mystery. What is clear is that camelid color genetics has no direct parallel in any other domesticated species. It is also clear that, even as the basics are beginning to be unraveled, there are still an awful lot of wild-cards. The researcher doing the most serious work in alpaca color genetics today is Dr. Kylie Munyard at Curtin University in Australia. Her paper, “Inheritance of White Colour in Alpacas,” published by the Australian Government in 2011, details her efforts to compare alpaca colors to known color gene markers in horses. What Dr. Munyard found, in a nutshell, is that alpacas share the two basic color gene loci in common with all mammals: the Agouti locus and the Extension locus. The Extension locus in alpacas, as in horses, appears to possess only two possible alleles: the Black allele (E), which is dominant, and the Chestnut allele (e), which is recessive. Thus, an alpaca with one or two copies of the Black allele will be base black and will produce eumelanin. An alpaca with two copies of the Chestnut allele will be base brown (also known as base red or base chestnut), and will not be able to produce black pigment – it can only produce pheomelanin, which is reddish. Thus, the darkest color that may be found on a base chestnut animal is a deep mahogany brown. The Agouti locus possesses many more alleles, and is much more complex. According to Dr. Munyard's research, it is the Agouti locus that appears to control the majority of color expression in alpacas. She has found that the Agouti locus contains at least five alleles in alpacas, though it may be seven or more. The most dominant allele that Dr. Munyard found on the Agouti locus is the Light allele (Aw). Thus, an alpaca with at least one copy of the Light allele will appear light in color, regardless of what other allele it carries on the Agouti locus. Interestingly, Dr. Munyard found no genotypic difference at the Agouti locus between white and light fawn alpacas; it is likely that the variation therein arises from other genetic factors. The most recessive allele on the Agouti locus is the Black allele (a). An alpaca must carry two copies of this allele to appear true black. At least two other alleles exist on that locus that fall in between Aw and a in terms of dominance, and various combinations thereof give rise to various shades of bay black through light brown. The alpaca color genetics book is far from closed; for example, Dr. Munyard's research has not yet explained the genetic difference between the vicuna pattern versus solid distribution of color in fawns, nor has it ventured into the realm of patterns (including Tuxedo and Harlequin Appaloosa). Thus, it has largely been up to breeders to extrapolate from their own breeding results. The Harlequin Appaloosa coloring is by far the most mysterious of the alpaca colors. It appears to pop up at random, from lines with no Harlequin Appaloosa animals going back many generations, leading many breeders to speculate, originally, that it may be recessive. This, however, appears to be inaccurate, and the evidence that the Harlequin Appaloosa gene is, in fact, autosomal dominant is substantial. For one thing, there are many Harlequin Appaloosas who appear to reproduce their coloring with great reliability, even when paired with animals that are not Harlequins or suspected Harlequin carriers. The breeding of two Harlequin Appaloosas does not produce a Harlequin Appaloosa 100% of the time, which would be expected if the gene were indeed recessive. Lastly, there are many Harlequin Appaloosa offspring of renowned, extremely prolific herdsires who are highly unlikely to have carried the gene (because if they did, the gene would be far more common than it is). Nevertheless, it is clear that many genetic factors must align in order for an alpaca to display the Harlequin Appaloosa coloring, because there are many dozens of animals that are known to carry the gene without expressing it. Carriers of the gene have been identified in true black, white, beige, and solid fawn and brown, as well as in roan (“modern” grey), Tuxedo Grey and Pinto. Thus, it appears that something prevents the gene from being expressed in these colors. On the other hand, vicuna fawns, bay blacks, and bays (dark-pointed brown) are, by and large, conspicuously absent from the carrier list. The additional factor that confounds Harlequin Appaloosa breeders is the incredible variety of colors and patterns in which the Harlequin Appaloosa gene can manifest itself. There are two major phenotypic characteristics that are associated with the Harlequin Appaloosa gene: spotting and color change. The variety of ways in which these factors may be manifest, however, is astounding. The classic Harlequin Appaloosa is born light fawn, with black spots (sometimes only one or two) on its muzzle and belly. The spots often increase in number and intensity as the cria grows. When shorn, it is seen to have changed – very dramatically – to a grey animal, and it stays grey, though the telltale spots remain visible throughout its lifetime and generally continue to increase and darken. This classic coloring appears to be only one manifestation of the gene, however. Not all Appaloosas change color (indeed, most breeders differentiate Harlequins from Appaloosas based on on whether or not they turn gray). Some True Appaloosas are born fawn (or beige) with darker fawn or brown spots – and stay that way. Others – the “solid” Harlequins – are born solid fawn, with little or no apparent spotting, and shear out to a solid silver or rose grey. There appear to be several distinct categories of Harlequin Appaloosa coloring, and it seems that any one variety of Harlequin Appaloosa can produce any other, suggesting that all varieties are ultimately the product of one single gene (rather than multiple allelic variations). Some breeders have observed that the Harlequin Appaloosas all appear to have black somewhere in their lineage, while the Appaloosas may not. This may be a bit of a red herring (many alpacas have black in their lineage), but it is interesting to note. It is certainly difficult to deny that Harlequin Appaloosas all appear to be base-black (eumelanin-based), while some, perhaps all, Appaloosas do not appear to carry any black pigment. The thing that is most striking about the Harlequin Appaloosa gene is its ability to “hide” in a bloodline for many generations, then pop up unexpectedly – and then, once having appeared, to subsequently breed true (reproducing itself reliably). Most serious Harlequin Appaloosa breeders have a list of original imports and ancestors who are known to carry the gene. Many are very well known as carriers, while others appear in the pedigrees of only a handful of Harlequin Appaloosa ancestors. Meanwhile, there are certain individuals who are extremely well-known Harlequin Appaloosa carriers, with dozens of Harlequin Appaloosa descendents – none of of which are own offspring. That is, these individuals clearly carried the gene, and passed it on extremely reliably to their offspring, who subsequently produced Harlequins – yet they themselves never produced a Harlequin Appaloosa. The individual that is the most spectacular example of this phenomenon is SA Peruvian Black Epic. Although perhaps the best known Harlequin Appaloosa carrier amongst Appaloosa breeders today, Black Epic has not one Harlequin Appaloosa – of any variety – to his credit. (This has been confirmed by his lifelong owner, Shawna Brummet, PhD.) Pedigree analysis indicates that he inherited the gene from his dam, SA Peruvian Klassique Gray, who has other Harlequin Appaloosa descendents that are unrelated to Black Epic, and Black Epic himself has dozens of grand-get and great grand-get that display the gene – but no own offspring. Examining the evidence at hand, I have started to piece together a putative theory of Harlequin Appaloosa inheritance. First, it appears almost without question, based on the evidence above, that the gene is simple autosomal dominant. It also appears that the gene can only be expressed only under certain very specific epistatic conditions. True black and white alpacas do not express the Harlequin gene. I hypothesize that this is evidence that the molecular actions of the Harlequin Appaloosa gene requires a certain amount of pigment to be expressed. I hypothesize that the gene causes pigment to consolidate differently during embryonic development (resulting in spots), then drives a gradual increase in eumelanin production during the course of the animal's lifetime. This is why pheomelanin-based Appaloosas are born with spots and do not darken while they age, while eumelanin-based Harlequins darken and gain spots. True blacks are “too black” for the gene's effects to be displayed; they have so much pigment that the consolidation is not noticed. Whites do not have enough pigment for the consolidation and spotting to be noticeable. The variety of Harlequin and Appaloosa phenotypes result from the actions of the Harlequin gene on various other alpaca color genotypes (for example, a beige Appaloosa may be a chestnut-based light fawn with the Harlequin Appaloosa gene, while a classic Harlequin Appaloosa may be a black-based medium fawn with the Harlequin Appaloosa gene). Solid fawns and browns lack a gene that allows patterns to be expressed. This appears to be a consistent fact of alpaca colors and patterns; solid fawns may mask Tuxedo and Pinto as well as Harlequin. Because the same gene that appears to mask pattern also typically results in a very uniformly colored fleece, this gene is actively selected for by breeders of fawn alpacas, making it disproportionately common. Tuxedo and Pinto appear to “mask” harlequin in most cases, though there are some “breakthrough” cases in which an animal appears to express both the Tuxedo and Harlequin or the Pinto and Harlequin genes at the same time. In the case of Pinto in particular, once an alpaca expresses both genes, it appears capable of producing offspring that express both genes as well. I am not ready to speculate as to why this occurs! Lastly, I speculate that the Harlequin Appaloosa gene may, in fact, be two tightly linked genes, rather than one. I am currently on the fence about this; however, it would help to explain how it is that the gene can “hide” so readily down generations before suddenly being expressed – and subsequently breeding true. A recombination event could explain this. All of the above is pure speculation on my part, and I am sure that not all of my hypotheses will bear out as true. However, it is a start. I have been fascinated by, and have been extensively (perhaps even obsessively) studying animal genetics – color genetics in particular – for my entire life. I hold a Bachelor's degree in Animal Science from Cornell University and a Doctorate of Veterinary Medicine from Tufts, and I have edited and written a good portion of a book entirely devoted to the color genetics of Ball Pythons. It is with this background that I share my speculations regarding Harlequin Appaloosa color genetics. Take from it what you will. 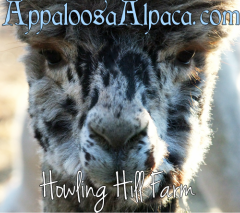 AppaloosaAlpaca.com and HarlequinAlpaca.com are owned and maintained by Howling Hill Farm.